The interesting from this talk was the future direction of JRuby including replacing the current the Lexical Analysis parsing to an AST with a Semantic Analysis to an Intermediate Representation. This will allow for optimization, before passing to compiler (via Control Flow Graph, and Data Flow Graph analysis?). In the further future there may be foreign function interface support at the jvm level (Charlie has submitted an ffi proposal, 2016 at earliest), and there is the experimental truffle and graaal. What is clear is there will be no further support for ruby-2.0.0 (experimental in JRuby 1.7) with JRuby-9000 aiming at ruby-2.1.0 support. Seems we may not need to wait too long to test the new Intermediate Representation runtime (and then we might also be able to start using ruby-2.1.0 syntax?). 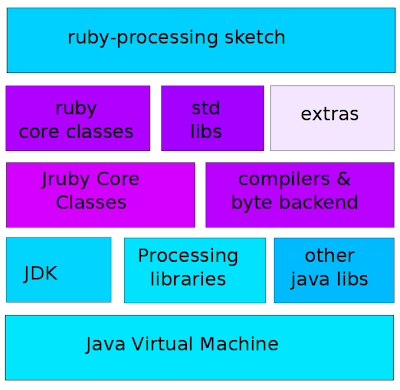 JRuby master now has a working mixed-mode (interpret + JIT) for the new IR-based runtime. Master will switch to IR very soon .